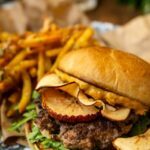 The Autumn Burger with Roasted Squash Aioli and Apple Chips recipe is the perfect ode to fall in portable burger form. Tear the bread into tiny chunks, or pulse in a food processor until they are crumbs. Combine the bread and the buttermilk in a bowl and soak for 20 minutes. Add the pork and veal, grated onion and ancho powder. Mix together by hand to combine completely. Form into 4 quarter-pound patties. Cover and chill in the fridge until ready to cook. Slice the apples paper thin on a mandoline and arrange in a single layer on a parchment paper-lined baking sheet. Sprinkle with a hint of salt. Place in oven and bake for 2 to 2 1/2 hours until the chips are crispy. Carefully remove the chips from the pan and store in an airtight container. Slice the acorn squash in half and scrape out the seeds. Rub with oil and place on a baking sheet, flesh side down. Flip the squash and roast another 15-20 minutes until fork tender. Remove from oven and allow to cool until safe to handle. When cool, scoop out the soft inner flesh and put into a clean food processor with the mayo, garlic, and a dash of coarse ground black pepper. Pulse to combine. Scrape sides and make sure everything is mixed well. Store in an airtight container in the fridge until ready to use. Heat a heavy cast iron pan over medium-high heat until hot. Add butter to the pan and swirl to coat. Place the burgers in, not overcrowding the pan and cook until the bottoms have gotten a good crisp. Flip and cook until the other side is crisp and the burgers register 160 degrees F.
Rest the patties while you toast the buns and prep. Place the greens evenly over the bottom buns. Add the patties on top and arrange apple chips over each. Slather the roasted squash aioli over the tops of the buns and secure them on top with a toothpick to serve. Making your own mayo is EASY. Give it a go with this recipe.